The Mega Man series has been on a long, strange path over the course of it's life. Although the main series titles (those titled "Mega Man [Number]") have been fairly consistent (more or less), the series went through a number of side series and other iterations that changed the formula. There was future-set Mega Man X series, which explored X fighting animal-style robots (instead of human-style robots), and gave X the ability to gain upgrades to enhance his exploration capabilities. This was then followed by the Mega Man Zero series, which added on open-world exploration and collectible chip upgrades. And then the series pushed further, with Mega Man ZX, exploring the Zero style even further. But then there were other narrative diversions for the series, from Mega Man Soccer -- which, seriously, don't play this game -- to the Game Boy spin-off titles for both the classic series and the X series as well (with the appropriately awful Extreme subtitles). Hell, there's even a completely separate universe for the series, one where the Internet, instead of robots, are the technology of the future. This series, Mega Man Battle Network, is an action-RPG series and very different from any of the mainline titles. This series did have a spin-off continuation, Mega Man Star Force, as well as a side-scrolling platformer, Mega Man Network Transmission. And yet, even now, the original series keeps coming back, every few years, with another numbered title. The Nintendo Wii saw two 8-bit inspired titles, 9 and 10, which not only saw a return of the NES-era graphics and sound, but also reduced Mega Man back down to his basic abilities. Mega could run, jump, shoot, and collect boss weapons, but all the extras he'd collected over time were gone -- no Rush, no slide, and no charged shots. It was like ever game between 3 and 8 (plus Mega Man and Bass) never happened. And the thing is: the fans loved it. This return to classic form was hailed by players -- they loved the difficulty, the refined, basic game play, and the fact that Capcom has respected their classic era with this new title. The series, though, sat idle for a long while. Long-time series lead (and the guy credited with not only overseeing every game since Mega Man 2, but also with giving the first game it's distinctive look and feel), Kenji Inafune, left Capcom over creative differences. This put the future of the series into doubt as many of the project he wanted to create were scrapped. Inafune went off and Kickstarted a new game, Mighty No. 9, a title with the promise to start a new spiritual successor series to the classic Mega Man games. The Kickstarter was wildly successful. The resulting game, though, was decidedly mixed -- fun in places, but pretty crappy over all. That left the original Mega Man series in an interesting place. The series creator was gone, but his follow up game, the one that promised to steal the crown from the original Blue Bomber, died like a wet fart. Could Mega Man return, and what form would his games take? Well, Capcom has given us that answer in Mega Man 11, a game that pushes the Blue Bomber back out of the 8-bit era into a modern look and feel. However, his game play is still classic Mega Man. 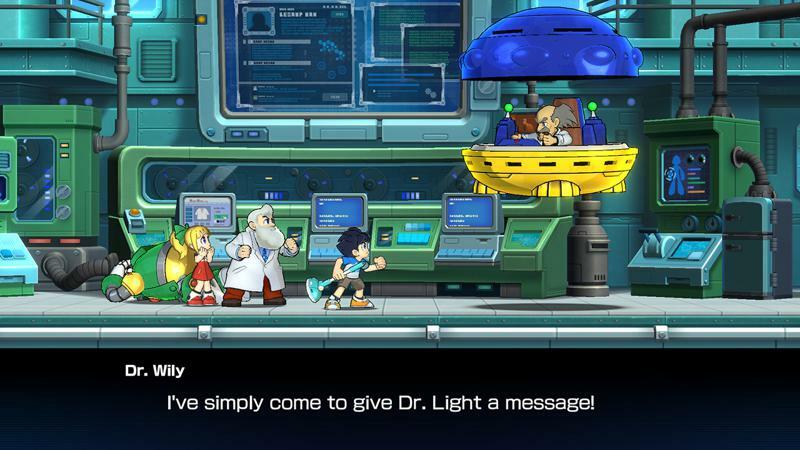 As established in the story, Dr. Wily (the evil villain of every mainline game in the series) and Dr. Light (Mega Man's creator) used to be at university together, many decades ago. Dr. Wily invented a powerful utility for robots, the Double Gear system, but the rest of the faculty laughed at him and his invention. Furious, he destroyed the prototype and stormed out. He then pursued a life of crime (with robots). Now, returning once more, Dr. Wily has finally reinvented his Double Gear system. Capturing a bunch of robots (eight, of course), Wily reprograms them and gives each a Double Gear, then sets them up to do battle with Mega Man once more. It's up to Mega (with his own Double Gear) to take on the robots, and Wily, and once more save the day. 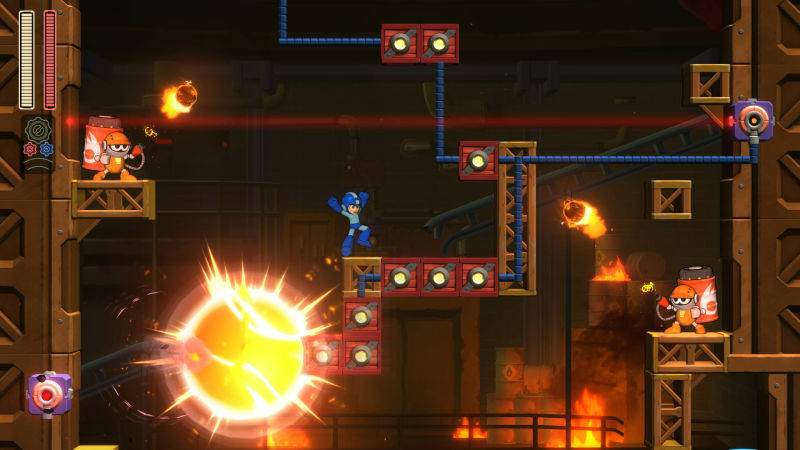 As you can tell from the story, Mega Man 11 doesn't deviate far from the classic play-style of the series. There are still eight robots to battle (the standard ever since Mega Man 2, eight special weapons to collect and use against the other bosses, and a final Wily Skull Castle to break through all for a shot at Wily in his final robotic vehicle. If you're looking for something new or different from the series, well, you'll have to go play one of the other classic, spin-off titles. Even Mighty No. 9 deviated farther from the formula than this new iteration of the series. You will get Rush, and sliding, and the charge buster, all of which return for use once more, but this isn't a game that pushes very far away from what came before. That said, some may not complain about another, standard Mega Man title. There are plenty of fans of the classic formula that certainly appreciated another title that gave them everything they wanted. That said, after 11 main titles (12 counting Mega Man and Bass), one would expect a "modern version" of Mega Man to feature more than just another basic adventure. The Double Gear system notwithstanding, there's nothing in Mega Man 11 that makes it feel different from the games that came before. In fact, bringing back Rush, and the charge buster, and sliding actually all makes the game feel like a safer iteration, something for everyone without anything stripped back or removed to refine the game play. The Double Gear system is interesting on its own. As setup, there are two different parts to the gears that can be used. Speed Gear give Mega Man a slow-time effect, which could allow for fast reaction from him (and, with an upgrade, have him more in real-time while everything else is slower). Meanwhile, Power Gear enhances Mega Man's basic attacks, allowing him to overcharge any of his weapons (not just the classic "lemon" shooting Mega Buster but also all the weapons he gets from the bosses he kills). While each of these items are neat, I wouldn't say they're all that original. We've seen plenty of games with slow-time effects (pretty much ever since bullet time was popularized in The Matrix), while overcharged weapons were already in the series, since they were a function of X's upgraded arm cannon in every Mega Man X game. The gears are evolutionary for the main series, not revolutionary. The game does one thing that's pretty neat with the gears, though: it gives them to all the bosses. When fighting any of the baddies they will, inevitably, use one of the gears (or both, in some cases), creating for some pretty frenetic attacks. Block Man gets a whole second form when he activates his Power Gear, while Tundra man flies across the screen with his Speed Gear. The game implements these powers to good effect, even on classic bosses (like the returning Yellow Devil). While the gears may not make the game entirely new or different, it's nice to see the designers think through what this new power would do to all the robots of the world. It's an interesting, world-building touch that I liked a lot. Beyond the gears, though, this game is going to play just like you imagine. Controls are tight and responsive, allowing you good, direct control over Mega. However, I will note that there were some times where I found the controls a little confusing. There are a lot of buttons mapped, with not only quick weapons swap enabled but also quick Rush summoning and button-maps for the gears as well. This is a lot of buttons to remember and there were multiple times where I went for a weapon and instead pressed a gear, or went to use a gear and summoned my faithful dog instead. For a series that traditionally only used two buttons for all the main game play, having all these new features cause is a bit of overload. I can certainly see speedrunners getting great use out of them, but for a crap player like myself, I felt overwhelmed at times. It is also, as you'd expect, very difficult. It's a Mega Man game, after all, so expect plenty of traps to send you to your very-instant death over and over, and if you somehow survive all of those, you'll still be soaking plenty of damage along the way. Getting through to any of the bosses is, naturally, a challenge, and being able to finish off just one with your pea-shooter will take a lot of work (and probably generate plenty of frustration). There are multiple difficulty levels for you to play on, so even a newb like me can at least gain some ground on the game, but even the easier modes can still be a struggle at times. And that's before we even get to some of the powerful bosses in the Wily Fortress and all the ridiculous attacks even overcharged enemy can have. 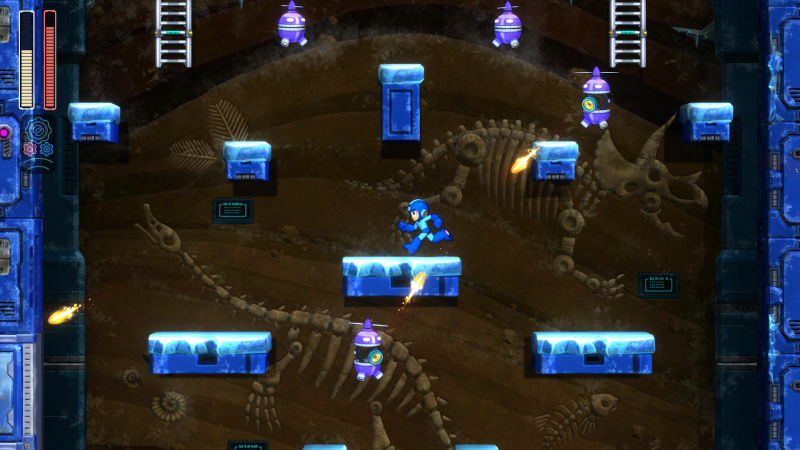 Mega Man 11 is an endurance trial like the hardest games in the series. The thing is that while Mega Man 11 is a good, solid Mega Man game, it's still very much a Mega Man game with all the connotations that brings. Aside from the graphics, there really isn't anything that will say "this is a modern Mega Man" for anyone that plays it. it doesn't change up the formula in any interesting way -- no Dr. Robot-like stages, no special mid-point fortress, and no change to who the final boss is or how he really performs. This is, through and through, the very definition of "yet another Mega Man game." Which then makes me wonder why they even bothered to update the graphics. Mega Man 11 features the kind of polished graphics I expected from the SNES/PSX era, and, to be honest, I wasn't entirely a fan of those either. While the newer graphics are nice, just as they were the last time Capcom attempted to update the formula, they don't feel like Mega Man. There's a specific scale and size you expect for Mega, and the larger, more detailed sprites throw off that vibe. For a comparison, when Nintendo makes a new side-scrolling Mario game (like the New Super Mario games), they keep the new graphics to a similar scale as old. That balance hasn't been maintained well in "modern" looking Mega Man games, throwing off the look, feel, and control of the games. When you can't predict how tall a "sprite-block" is because the games uses a different scale than you're used it, it throws off your controls, your sense of where your character is and what his abilities are. 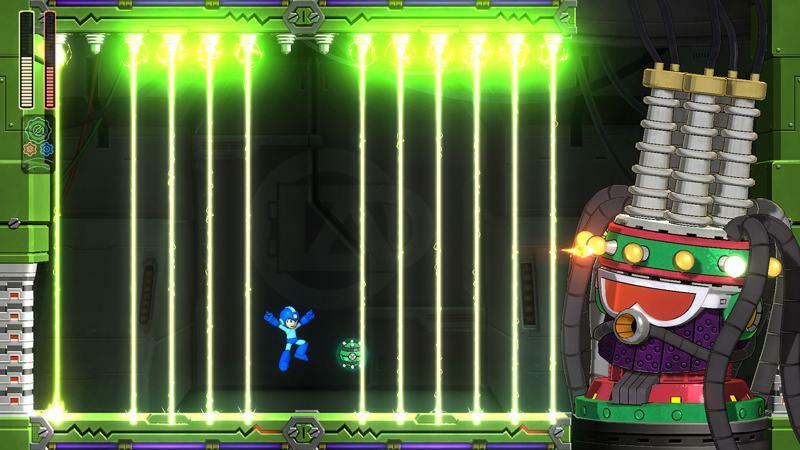 There's something to be said for Mega Man 9 and Mega Man 10 as they went back and restored that proper, Mega Man scale. And when you have those two, classic-inspired titles, why upgrade? 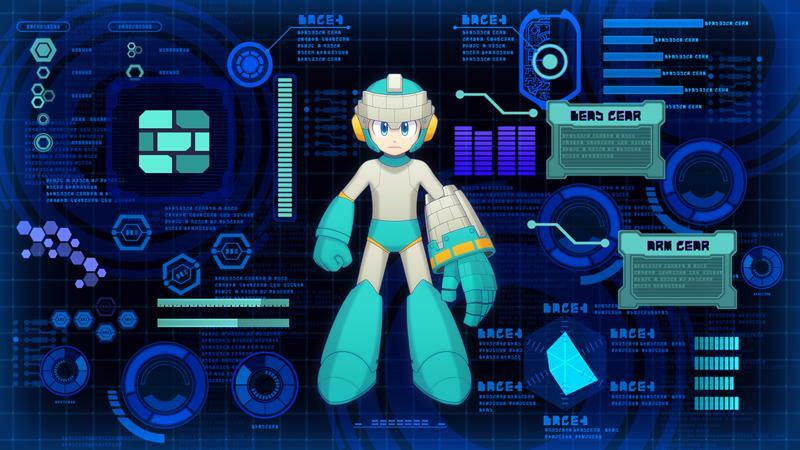 Fans know what a Mega Man game is supposed to look like. It's not supposed to look like Might No. 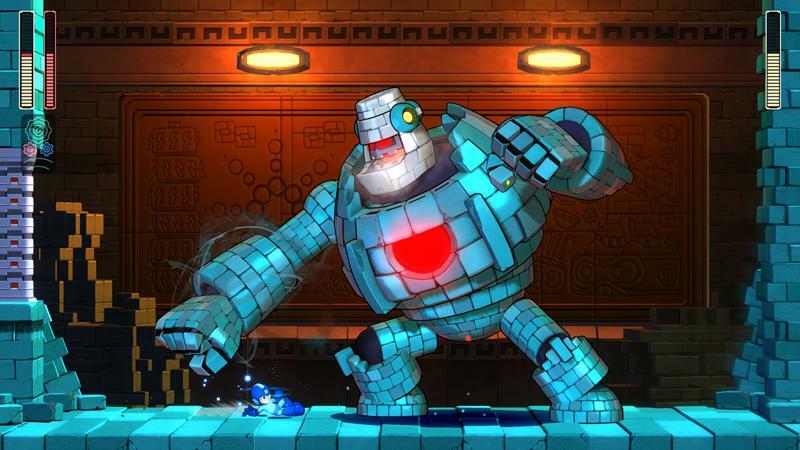 9 -- which, from the 3D-style graphics to the boss weapons changing how Mega Man looks, Mega Man 11 is clearly taking a page from that failed spiritual successor. Updating the graphics doesn't add anything to the game and, for me, it only detracts from the charms of Mega Man, especially when it seems like the new graphics don't really add anything. It may look modern, but it plays like a classic game. What's the point? 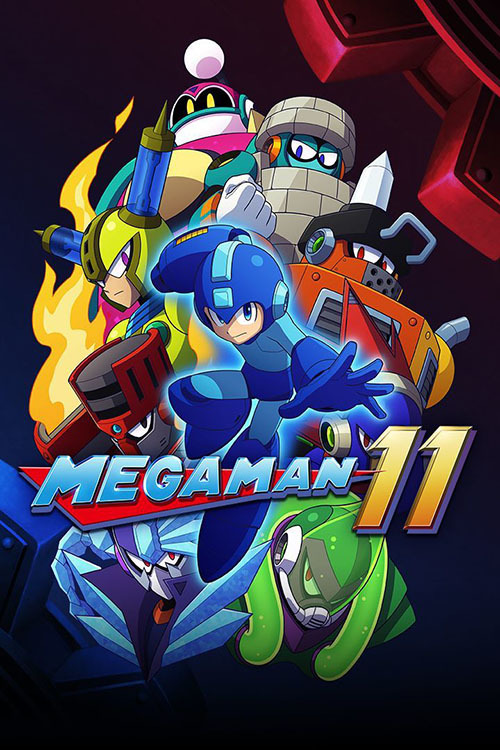 Mega Man 11 is exactly what it says on the package: a Mega Man game, and exactly that. If you want another iteration of the same formula, this time with a fresh coat of paint and one new ability, this is the game for you. Anyone else looking for a little more will just have to wait for the next, inevitable, reinvention of the series. Mike Finkelstein is the creator and editor-in-chief of Asteroid G. He's also the creative head behind The Inverted Dungeon, CVRPG, and Dodeca System, and many more projects it would take too long to list. He hails from a Far Away Place. Asteroid G created by Mike Finkelstein. This web site is a work of fandom, criticism (as in to review and critique), parody, and creative sharing. All articles and fiction posted on Asteroid G are copyright their resepective writers. All featured properties (such as movies, video games, books, etc.) and their logos, images, and characters are copyright their respective owners and used only for discussion purposes. The creators and editors of the Asteroid G and the Inverted Dungeon do not lay claim to any of the external copyrighted works featured within. If you feel your logo or image was used in error, please contact the staff to discuss the matter. Asteroid G uses the Disqus comment system. Please read the Asteroid G Comment Policy before posting.